i finished the second TechGuy sock today. w00t! my s.o. has quite long feet, so it was no easy feat (har har). 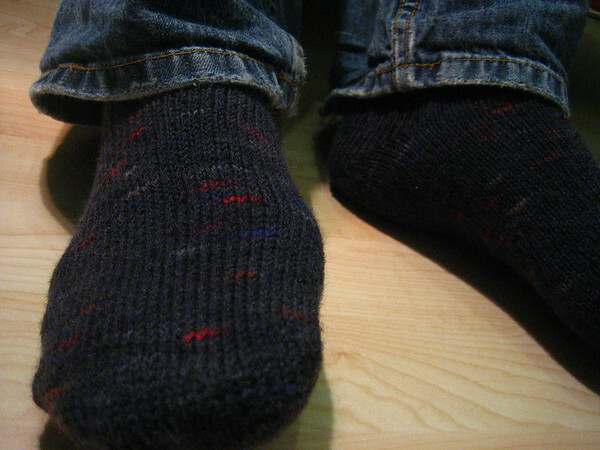 if i make him socks again, they will be with a thicker weight yarn to obtain a less stitch-intensive gauge. if you are yearning to knit your first pair of socks, and you’ve never knit in the round, i would recommend grabbing a book or two from your local library before attempting this. i managed to figure it out, but i did undo the first heel three times. now i’m inspired: the next pair will be for myself. i’m thinking i will try toe-up construction to obtain the longest sock possible out of the yarn on hand and may include some fancier stitches to keep myself from getting bored. This entry was posted	on Saturday, February 10th, 2007 at 17:41	and is filed under knit. You can follow any responses to this entry through the RSS 2.0 feed. You can leave a response, or trackback from your own site.